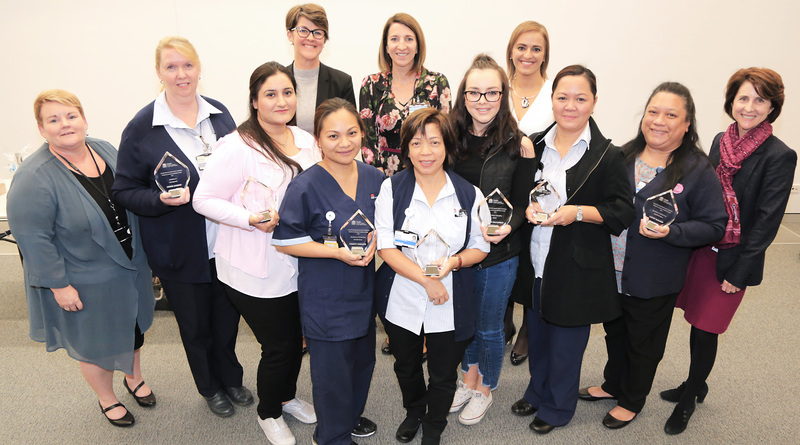 Blacktown Hospital International Nurses and Midwives Day award winners. Front row left to right: Blacktown Hospital acting general manager Jude Constable, Excellence in Management winner Debbie Murphy, Excellence in Clinical Care winner Amanpreet Kaur, Excellence in Clinical Care winner Christy Durante, Excellence in Clinical Leadership winner Gloria Miranda, Kerry Weaver Award for Outstanding Midwifery Care winner Bridget McCaffrey, Excellence in Nursing and Midwifery executive award winner Rosalie Caliwag, Excellence in Clinical Care winner Lindsay Banares and executive director of nursing and midwifery and clinical governance Joanne Edwards. Back row left to right: NSW Health System, Purchasing and Performance deputy secretary Susan Pearce, Blacktown Hospital director of nursing and midwifery Danielle Levis and deputy director of nursing and midwifery Rola Tawbe. Blacktown and Mount Druitt hospitals have celebrated International Nurses and Midwives Day with trivia challenges, a Million Dollar Nurse Challenge, BBQs and pizza for the nightshift. There was fierce competition between the wards and disciplines to outshine each other in the general knowledge and hospital-based questions challenge before undertaking a series of skills tests including setting up an IV line and putting a nappy on a doll one-handed. Blacktown and Mount Druitt hospitals director of nursing and midwifery Danielle Levis and deputy director Rola Tawbe met with all the nurses and midwives, taking them for coffee, while the nurse managers at Mount Druitt treated their staff to home-made morning tea. “Thank you all for your contributions to the health and wellbeing of the patients and community,” Ms Levis said. “You make a difference everyday to those you come in contact with. “Thank you for your dedication and commitment,” she said. Staff at both facilities took delight in feasting on either a bacon and egg breakfast or a sausage sizzle. Night shift staff were not forgotten, receiving pizza delivered to their wards as a token of appreciation. More than 100 staff attended the award presentations with a special visit from NSW Health System Purchasing and Performance deputy secretary Susan Pearce and Western Sydney Local Health District executive director of nursing and midwifery Joanne Edwards.